There is no non-surgical treatment for acute compartment syndrome that is effective. Fascia is non-elastic and does not stretch or expand easily (similar to leather). Compartment syndrome (acute) can permanent damage within hours of its onset. Compartment syndrome can occur in any part of the body. Seek the advice of a Physical Therapist to fully rehabilitate an involved body part if surgery is performed to eliminate the symptoms of compartment syndrome. People suffering from compartment syndrome normally feel a deep, constant pain in one part of the body (usually the leg or arms). Severe high pressure in a compartment of muscles and nerves results in a decreased blood flow to the area, intense pain, swelling and decreased sensation and movement. Proper and timely treatment can lead to full recovery. There are two kinds of compartment syndrome: acute and chronic. Acute compartment syndrome is a medical emergency and must be treated right away to prevent permanent damage and even loss of limb. It is caused by a traumatic injury like a car wreck. Chronic compartment syndrome can be induced by a repetitive, high impact exercise and can inhibit someone from performing an activity due to the developing symptoms. Our bodies must maintain stability of internal structures while also supporting a range of movements. A leather-like sheath of material, fascia covers everything including muscles to provide internal stability during movements. The fascia does not stretch easily and has significant “binding” capabilities for all of the structures in the body. It is able to “hold” everything in its proper location regardless of the movement or actions that occur during movement of any intensity level. If there is increased blood flow to this structure resulting in excessive pressure, it will produce the symptoms of compartment syndrome. This increase in blood flow can be caused by a serious trauma that leads to hemorrhaging, and it can also be caused by a repetitive activity involving specific muscles. The symptoms most commonly associated with compartment syndrome are intense pain, swelling, numbness or tingling in the compartment and distally, possible paralysis of the muscles, which usually indicates permanent damage to the contents of the compartment. 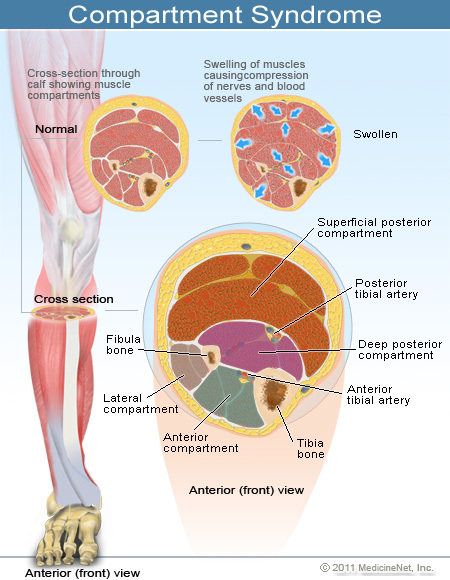 While acute compartment syndrome can occur in any area of the body, it most common affects the anterior lateral shin. This compartment houses the muscles that control some of the motions of the foot and ankle complex. A traumatic injury like a broken bone, a crush, a car accident, severe contusions, and even tightly fitting bandages can cause this acute condition. If excessive and abnormal bleeding or swelling occurs within the compartment and the fascia is stretched beyond its capabilities, the pressure within the compartment’s contents rises and becomes a medical emergency. The excessive pressure is exerted on the nerves, blood vessels and all soft tissue in the compartment. The blood flow is disrupted and can be stopped completely. The lack of proper blood flow can lead to damage or death of any of the structures in the compartment. The pressure must be relieved immediately. A surgeon must perform a fasciotomy which entails making a long incision along the length of the compartment and cutting the fascia to relieve the pressure. Many of these incisions will eventually require a skin graft. Physical Therapy begins when the incision is healed and the pressure is normal in the compartment. The rehabilitation goals are primarily to re-establish the normal motion, strength, proprioception, muscular endurance and functional capabilities of the involved compartment. Chronic compartment syndrome or exertional compartment syndrome develops when the when the compartment is placed under a great deal of stress. Anyone who has exercised or performed a strenuous/repetitive task has experienced the “pump” within a muscle group. The muscles feel swollen and are gorged with blood. If this occurs and the fascia is not able to expand far enough to accommodate the increased blood flow, the pressure inside the compartment will rise to a level that produces a pseudo compartment syndrome. The symptoms of pain, tingling, numbness and cramping are present and usually force the person to stop performing the task that produced them. There are tests that can be performed to measure the pressure within the compartment. If exertional compartment is suspected, the doctor will take a pre-activity measurement of the pressure within the compartment and compare that value to the amount of pressure that is present when the person reports that they are experiencing the symptoms while they perform the activity. If it is determined that the activity causes pressure great enough to produce the symptoms of compartment syndrome, the individual may choose a procedure that would allow the continuation of the activity without the intense pressure. A surgeon may perform a fasciotomy and “release” the fascia. Physical Therapy following the release of the fascia consists of modalities and exercises to reduce the swelling and pain. This is followed by a slow and steady progression of activities and exercises that are geared towards helping the patient to regain all functions and have the ability to participate in any activity including the one that had produced the symptoms prior to surgery. Compartment syndrome of any kind is painful and debilitating. In most instances, the symptoms are severe enough to force someone to stop performing a given activity. In the event of an onset of acute compartment syndrome, it is critical that the person is treated surgically to prevent permanent damage to the nerves, blood vessels and muscles within the involved compartment. Compartment syndrome can be “fixed” and eliminated with the proper treatment and rehabilitation. 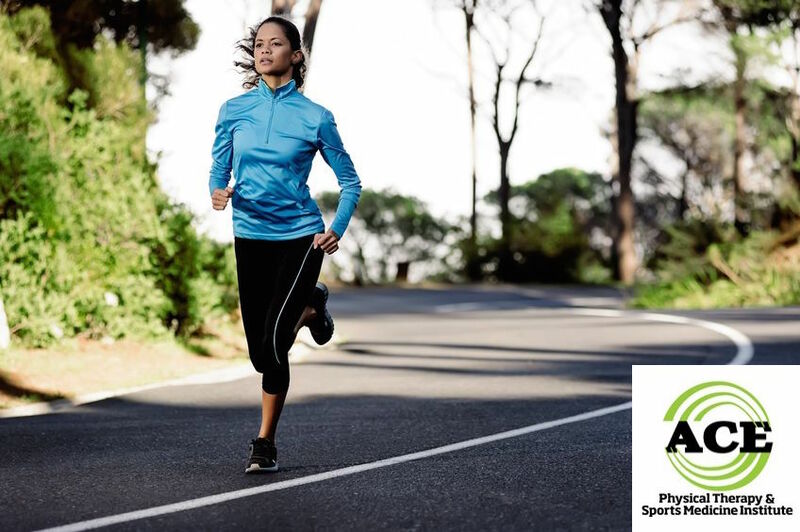 People that suffer from compartment syndrome and are treated correctly and timely are expected to make a full recovery and return to their pre-compartment syndrome lifestyle.